Many hearty pilots braved the toxic fumes spewing from the Big Island today, taking to the air and surfing the volcanic haze above two sites on Oahu. Jeff led the charge at Nanakuli, while Jetflap and Frank got things started at Makapuu. Conditions at Makapuu varied quite a bit throughout the day, starting out with a nice light north flow which favored sweet launches and toplandings at Manics for the early birds, and later veering to a more easterly direction to allow launches from Cactus for the late shift. 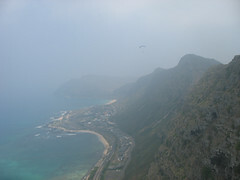 The haze seemed to vary in intensity depending on wind direction and cloud cover. At one point when it was really thick, visibility was down to half a mile or so, and I felt like I might as well have been flying deep in a cloud, or at night. (Of course I am just imagining what those conditions might be like - it would be illegal, crazy and dangerous to fly in clouds or at night). I finally had to land because I was becoming nauseated, either from breathing the fumes or from the lack of horizon reference. Oog! I got to fly with Jeff, Frank, Jorge, Suicide Pete, Nick, Reaper and Dave. Cliff, Russell, and Nightshift were launching as I left, and Sandy and Navy Don showed up even later. Ray and Jon stopped by but decided to wait for another chance. Great to see everyone out there.